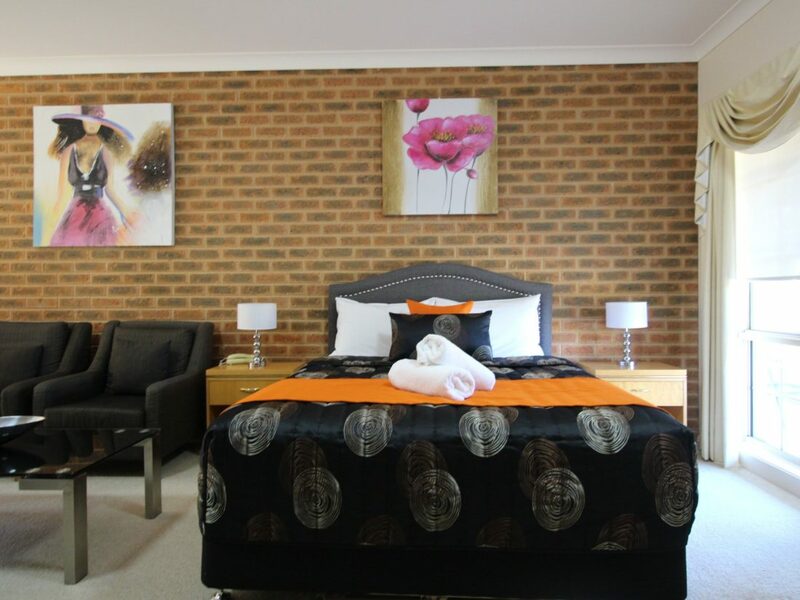 Simply the best accommodation in Yackandandah. Top of the Town Motor Inn features 20 quality modern and clean rooms, from a six person family room to a five person interconnecting room, as well as an executive spa room, deluxe spa room and deluxe queen rooms. All rooms have a kitchenette with tea and coffee making facilities including a fridge and toaster and limited crockery. Each room has its own bathroom with vanity, shower and toilet. All rooms are tastefully decorated with colour and art. Seating areas include a couch to occasional chairs with ottoman. In room facilities also include luggage rack, desk a dining table and chairs, a flat screen television as well as reverse-cycle air conditioning. Rooms are large and airy with windows front and back. Top of the Town Motor Inn is licensed to sell alcohol, you will find a selection of beer wine and spirit available to purchase at reception and they are proud to stock local award winning wines. Enjoy the swimming pool grounds and barbecue facilities. Pool towels, filtered ice, WiFi and guest courtesy shuttle bus service available, contact reception for all inquires. Modern rooms very clean and comfortable, quality linen, one queen bed, comfortable couch or two air chairs, kitchenette with fridge, toaster kettle, tea and coffee making facilities. Flat screen television, split system air conditioner, private bath room with shower, toilet, vanity and bench. Luggage rack, desk and closet. One queen and one single bed, kitchenette with fridge, kettle, toaster and tea and coffee making facilities. Interconnecting rooms seven and eight. Room seven has one queen bed with couch, kitchenette with fridge, toaster, kettle and tea and coffee making facilities. Also a separate bathroom with shower, toilet, vanity and bench. Luggage rack, desk and closet. Flat screen television and reverse cycle air conditioning. Room eight has one single and one set of single bunk beds. Linen is provided for bunks but not made up. Also included is a kitchenette with fridge, toaster, kettle and tea and coffee making facilities. Flat screen television, separate bathroom with hip bath, shower, toilet and vanity with bench, desk, closet and luggage rack. Large room, quality linen. One queen bed, one single bed and one set of bunks, bottom double, top single. Linen provided for bunks but not made up. Kitchenette with fridge, and tea and coffee making facilities. Dining suite, flat screen television. Separate bathroom with shower, toilet and vanity. Reverse cycle air conditioning, desk, luggage rack and closet. Large room with quality queen bed, two comfy arm chairs with foot ottoman, coffee table and dinning suite. Kitchenette with tea and coffee making facilities and fridge. Flat screen television and reverse air conditioning. Large bathroom with corner spa bath, separate shower, vanity and toilet. Five star quality bath linen is provided. One queen bed, kitchenette with fridge, toaster, kettle, tea and coffee making facilities, as well as couch and flat screen television. Luggage rack, desk and closet, reverse cycle air conditioning, table and chairs, separate bathroom with shower, toilet and a single person spa bath.